The Plaza Theatre is rapidly approaching the return of its seating and lighting, long ago pulled for the major construction on the stage box, annex and utilities upgrades. 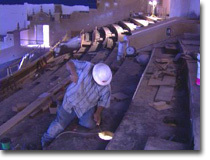 The Evergreene artisans continue to restore the theatres many painted ceilings while electrical crews pull more cable. Dressing rooms were coming together too with lots of showers installed for those big travelling Broadway show casts. The open courtyard on the annex room are also taking shape.